Mrs. Stella Christine Janes, 91, of Bardstown passed away peacefully at home with her family by her side on Tuesday, November 27, 2018. She was born on August 19, 1927in Bloomfield to the late James Howard and Frances Bell Elmore Hagan. 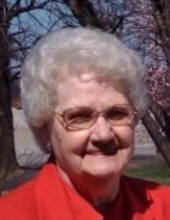 Christine was a member of St. Joseph Catholic Church and was a retired employee of 19 years from Barton Distillery and loved her family unconditionally. In addition to her parents, she was preceded in death by her son Joseph Vincent Greenwell, grandson Tyler Unseld, brothers, James, Leon and Buddy Hagan, sisters, Mary Loveland, Louise Bishop and Nancy Downs. She is survived by her loving husband of 65 years, Charles “Buddy” Janes, a son, Charlie Janes of Bardstown, 4 daughters, Diane (John) Unseld, Marlene Greenwell both of Bardstown, Faye Janes of Lexington, Mona (Danny) Allen of Bardstown, a daughter-in-law Judy Greenwell of Canada. She is also survived by 8 grandchildren, 13 great-grandchildren, 2 great-great-grandchildren and her sister, Phyllis Hagan Barnes of Elizabethtown, as well as several nieces and nephews. A Mass of Christian burial will be 11:00am Friday, November 30, 2018 at the Basilica of St. Joseph Proto-Cathedral with the Rev. Terry Bradshaw celebrant. Interment will be in St. Joseph Cemetery. Visitation will be Thursday, Nov. 29th from 3:00-8:00pm with 6:00pm prayers and Friday after 8:30am at the Houghlin-Greenwell Funeral Home, 1474 New Shepherdsville Road, who is in charge of arrangements. The family requests expressions of sympathy take the form of contributions to the Guthrie Opportunity Center. To send flowers or a remembrance gift to the family of Stella Christine Janes, please visit our Tribute Store. "Email Address" would like to share the life celebration of Stella Christine Janes. Click on the "link" to go to share a favorite memory or leave a condolence message for the family.